Getting around in Malta can be quite an adventure, sometimes not a happy one. An open and flexible mind is especially an asset if you don’t own a car. There are many different ways to get from point A to B; different scenarios will present different chal-lenges. In Malta, the most cost-effective ways to get around are by bicycle or bus. Unfortunately, both are not very reliable. There are very few bus lanes on the island, which means that buses often sit in traffic and arrive late. If you can afford the time, just grab a book and jump on a bus. If you can’t afford a long commute because you like to sleep in, bicycles (or motorcycles), on the other hand, are a good way to beat the morning traffic or rush hour. However, they are not always ideal. On rainy days or when you need to carry work stuff with you, this option may not be the most practical choice. 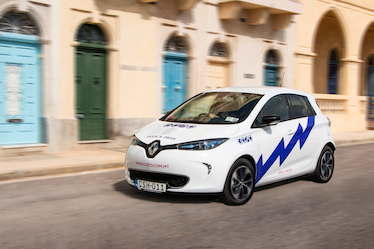 There is, however, a new addition to Malta’s transport options: GoTo car sharing. Car sharing cars can be an ideal addition to your transport ecosystem because it gives you the opportunity to hire a car by the minute, just when you need it. If you walk or cycle to work, buying a car seems like a big expense you could really save yourself. Most people end up buying a car because they know there are times when they will need a car, and a taxi or daily car rental is not a viable option. For example, a car is useful for your monthly shopping trip, to run errands at the weekend or a couple of times a month, or to visit a friend that lives on the other end of the island without spending half the day on a bus, or to just have the freedom to go where you fancy on the weekend. However, instead of owning a car for only those instances, these are also all perfect opportunities to use car sharing. If you only use a car for a few trips a month, then car sharing will change your life. Car sharing vehicles are available in every town in Malta. This means that you will be able to rely on the service wherever you are. Car sharing is ideal for you if you can be flexible. It may not be the best choice for you if you’re a busy mum with 3 school runs to do every day, but it is ideal for you if you know you’re the type that leaves their car parked somewhere 90% of the time. Using a GoTo car will save you all the expenses and trouble of owning a car. The immense cost of being a car owner will all be replaced with a membership fee of €7 and a €0.28 per minute charge on your trips (when choosing a Standard Plan). If you need a car occasionally, you can opt for a Basic Plan, which comes with €0.35 per minute rate but has no monthly membership fee. Do you think car sharing is for you?